You’ve probably heard about the fantastic momentum our campaign has heading into Christmas. This month we’ve taken the Democrats to task for their misguided economic policies and continued our strategy of grassroots campaigning despite the cold temperatures. 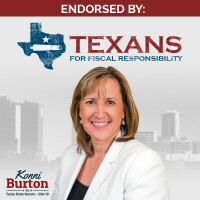 Today, I’m excited to announce the endorsement of Texans for Fiscal Responsibility! Texans for Fiscal Responsibility is the premiere conservative watchdog in Texas, making sure politicians stick to their promises of keeping taxes low and government limited. Please share this excellent news by spreading the word on social media!